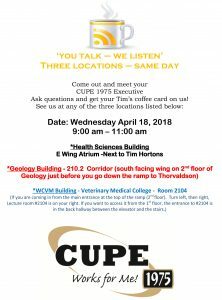 Know Your Numbers is a partnership between the University of Saskatchewan and CUPE 1975 to bring confidential, on-campus health screening clinics to help improve your overall health. Resting Heart Rate, Blood Pressure, Total Cholesterol, Height and Weight, Glucose, BMI and Waist Circumference tests. Our clinics for Summer 2017 are now over. We will be holding more clinics in Spring 2018. Please check back in early Spring to find dates and locations. Register through the site below. CUPE 1975 members will receive paid time away from your workplace to participate in the program. April 25, 2018 12:00 pm to 12:30pm Room 109 Arts Bldg. April 25, 2018 6:05pm to 6:30 pm Room 109 Arts Bldg. Information in regards to the Long Service and Retirement Banquet was listed in the March/April edition of the Skopein. If you missed reading this issue you can view it on this website. On the left hand column of this website you can enter the portfolio called Newsletter. There you will find the March/April 2018 edition. Please open up the links to see the alphabetical listing of Retirees and Long Service members who will be honoured at our June 1, 2018 Banquet which will be held in the Butler Byers Ball Room at the Western Development Museum. Letters of invitation will be going out April 18, 2018. You MUST RSVP to this letter in order to be included in the banquet. Please adhere to the deadlines listed in the letter. The list of retirees below also contains those members who took the Early Retirement Incentive Package. Even though some of the early retirees will not be officially retired until the fall, the union chose to honour them at this banquet. Listed below are the Long Service Members who will be honoured at our banquet June 1, 2018. Link attached for the latest Skopein. This edition features the list of retirees and long service members of CUPE Local 1975. 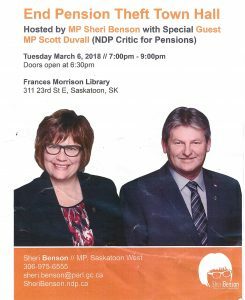 Join Sheri Benson MP Saskatoon West and Scott Duvall (NDP Critic for Pensions) as they talk about this important topic. Information in link and poster below. CUPE sending up to 4 OH&S activists to the Conference in Regina. If interested please send your name and course choices to CUPE1975@sasktel.net. Let us know which U of S OH&S Committee you serve on.